Please click the image to see an example of IT Policy. IT Policy is useful, when you need to print a document, which contains the rules and guidelines for use of the school’s equipment or internet connection. Please make sure you replace the domain name, logo etc., before the documents are printed. If you need support, we are here to help you. Contact us on our support phone: + 45 42 40 88 15 Monday to Friday from 08.30 am to 03.30 pm. 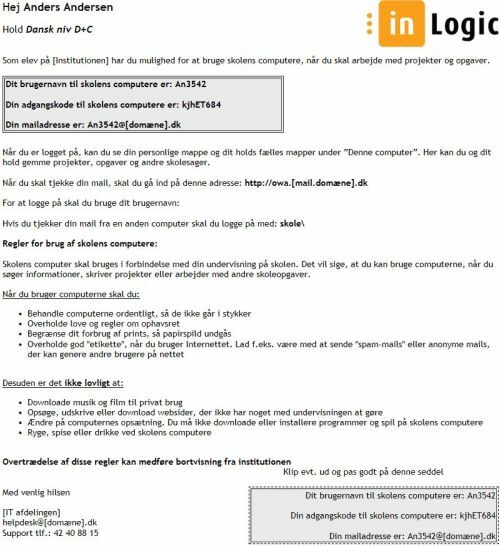 Outside of our opening hours you can send us an e-mail at support@inlogic.dk. With TeamViewer you can get remote support to solve issues, while you are watching. All it requires is that you give us access to your computer. When you click the button below, you download the TeamViewer-file, which you need to run.